and for anyone else trying it... I had to switch off hand tracking in NImate as it was clogging everything up and grinding to a halt. Joe, I've converted your question to a feature request. 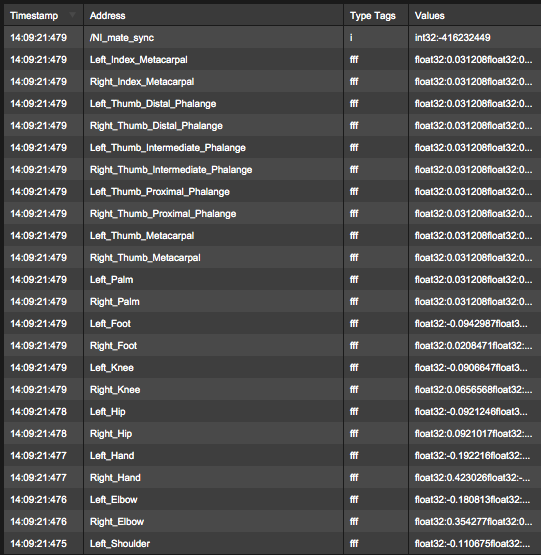 Related: Node set for skeletal tracking with Kinect. We did a cursory test of NI mate 2.14's "Kinect for Windows 2" sensor. 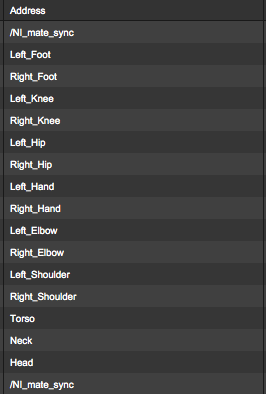 In "Basic" mode (with hands disabled), it outputs the attached 27 points. Not sure why it's excluding Chest and Pelvis and including some fingers, but that would be something we'd need to look at more closely when implementing this. Unless you happen to know. Thanks Jaymie. I'll borrow the V2 again and try to answer your question about random and missing points this week sometime. Although NImate is good at what it does it's just a little bit flakey, randomly shuffling it's Syphon outputs is one such annoyance. I'm guessing what you see in your OSC monitor is another example of the flakiness. It would be so much better to have the skeleton tracking done within Vuo. If I understand correctly from your other posts on the Skeleton Tracking feature request, you will likely not be implementing skeleton tracking from the Kinect, but from regular video cameras using one of the new ML libraries. That'll be great, other cameras are so much more flexible. If it's at least as reliable and accurate as what is currently available it will be a boon! I guess the ML is only going to get better as it is used more and more. Yup looks like I'm getting the same as you. (Monitoring in Resolume). I'll contact Jesse at Nimate and let him know. Assume you used an OSC monitor made with Vuo, could you upload that file please? So sadly this FR is redundant, NImate with Kinect v2 running on a mac does not output the extra joints as expected in the first image in this thread. You only get the same points as with the V1. NImate on Windows should output the extra points. A little follow up info from Jesse. Unfortunately Microsoft does not provide a Mac driver for their SDK and only libfreenect2 can be used on Macs. On a mac you are unfortunately limited to the Kinect 1 joints. If you have access to a Windows PC you could try using NI mate on it. So sadly this FR is redundant, NImate with Kinect v2 does not output the extra joints as expected in the first image in this thread. Agreed. Thanks for investigating, Joe. Has anyone made anything using orientations + coordinates from NImate?